« Just to prove the “bad Jesus” point . . . . I have finally found two books on the practice of history, each by a scholar (other than Richard Carrier), that address the core questions I have often raised with respect to flawed methods of New Testament historians dealing with Christianity’s origins. Both works address historical studies in general and only one from time to time casts a glance at what certain biblical historians are doing. One is The Logic of History by C. Behan McCullagh (2004). McCullagh is a philosopher of history responding primarily to the postmodernist challenges to traditional historical practices in the field of history generally. Some of his arguments apply not only to postmodernist approaches, however, but equally to a number of flawed arguments by more traditional biblical scholars. The other is Historical Evidence and Argument by David Henige (2005). In my next post I will address his fourth chapter titled “Unraveling Gordian Knots” where he applies his criticism to sentiments we find expressed repeatedly throughout New Testament historical works — and especially in regard to many New Testament scholars’ attacks on the Christ Myth hypothesis. 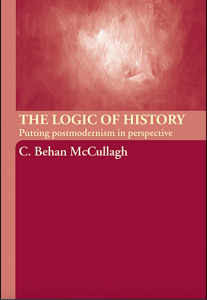 This post addresses a few excerpts from C. Behan McCullagh’s The Logic of History. Why has no-one else argued these points before? The points have been argued before but apparently rarely applied to the methods of scholars specializing in the history of Christianity’s origins and early growth. Nonetheless, when I first tried to think through how we came believe certain persons and events in the ancient past were historical and others not I was a little surprised that so little appeared to have been directly addressing this question. Historians often learn how to assess their hypotheses by studying debates in history in the course of their education. They acquire a capacity to evaluate their hypotheses critically, without always being aware of the standards of rationality they are applying. Awareness of those standards, however, will make it easier for historians to ensure that their work is rationally defensible. I hope that this introduction to the logic of history will quicken historians’ interest in the rational justification of their accounts of the past. It should help guide historians in the rational assessment of their own work and that of others. So McCullough appears to be acknowledging that most of the current works on the practice of history have overlooked and taken for granted “the standards of rationality” being applied and “logic of historical reasoning”. One assumption found throughout most works on Christian origins has been that we should assume that the narratives in the gospels were ultimately derived from historical persons and events. The question facing historians is to decide what those historical events and persons may have looked like beneath all their gospel mythical and theological overlay. It is taken for granted that the gospels were written for the purpose of conveying certain meanings about historical events and persons. Normally the conventional meaning of a text is the one which the author intended to convey, but very occasionally an author writes ironically, satirically, humorously or mistakenly, and intends to say something else. Jonathan Swift, for example, intended his book Gulliver’s Travels to be a political satire; and Cervantes intended Don Quixote to be a parody of knightly chivalry (see McCullagh, 1998, pp. 154–5). One can add to “ironically, satirically,” etc. “theologically, metaphorically, fictitiously….” as we find in several narrative books of the Old Testament and non-canonical Jewish literature of the Second Temple era. Continuing . . . .
To be sure of such interpretations, historians must often discover quite a lot about the circumstances of the text’s composition from other sources. At all events, the conventional meaning of a text is not necessarily its intended meaning. Is McCullough really saying that we need independent evidence to enable us to be sure of a certain interpretation of a text? So to be sure if a narrative about King Arthur or Julius Caesar or Jesus Christ is historical we need to find “quite a lot about the circumstances of the text’s composition from other sources“? The problem with using the Gospels as sources, however flawed, for the historical Jesus is that we have few “other sources” to help us interpret them. No, that does not mean that we must treat them as entirely fictitious. It means that we have a responsibility to suspend judgment pending other information. It is almost impossible to guess how people in the past read the texts before them. Even when they are fluent in the language of the text, and familiar with its context, it is common for people to find things in texts which were not there, or to distort what was said in some way. It is only when readers describe a text that an historian can be certain of their reading of it. If a person’s reading is inaccurate, then historians sometimes investigate the causes of the misreading, using it as a way into the mind and personality of the reader. All historians know the importance of understanding the perspective and bias of their sources. Nothing new here.
. . . How does one discover an author’s intention? There are a couple of problems with this procedure, however. The first involves the assumptions being made about an author’s beliefs, values and attitudes. How are these arrived at in the first place? Without specialized knowledge of their state of mind, one could only imagine that their views of the world were like ours, but that is bound to be wrong. So one cannot really discover the mental state of others by empathetic imagination, though often this technique is useful for suggesting possibilities. The second problem is that this method is quite uncritical. Once the historian imagines what someone intended to say, so long as this hypothesis seems to cohere quite well with what is known about the subject and their situation, it is accepted. But there could be other hypotheses even better supported by all the relevant evidence. Coherence is not enough. Here McCullough is addressing the common fallacies of correlation or confirmation bias. Rigorous methods require us to look for evidence that contradicts our hypotheses and to test alternative hypotheses. Anyone can find evidence to support a hypothesis that one belongs to any chosen star-sign. Correlations can have any number of explanations: causal, consequential, third party, chance . . . .
Or to apply the point to our immediate interest, just because the Bible says it’s so and entertains no doubts does not necessarily mean that it must at least be a little bit so. The appropriate method for discovering authors’ intentions is, once again, that of finding the best explanation of all the relevant evidence. An informed imagination can produce plausible hypotheses, but these must be checked against alternatives to discover which is most worthy of belief. So many hypotheses about the historical Jesus are built upon arguments of coherence. Placing enough gospel verses (e.g. about poverty) together against other information (e.g. about economic hardship of peasants) does not establish a bed-rock argument for Christianity beginning as a response to economic stresses as some scholars argue. Coherence is never enough to establish the credibility of an interpretation of a text. One way in which an interpretation of a text can cohere with other credible information about it, is by not contradicting that information, or rendering any of it improbable. This kind of coherence is clearly not enough to establish the credibility of an interpretation. Positive support for an interpretation of a text, however, is not always enough. If there is evidence that strongly supports a belief inconsistent with it, then the interpretation remains uncertain. Historians can display much ingenuity in explaining away inconsistent evidence to render their interpretation consistent with it, but if the explanation is ad hoc, that is without independent evidential support, then it is not credible. . . . The postmodernist argument continues by claiming that the historian is merely falling back on choosing whatever story he subjectively assesses to be the more coherent. In summary form the criticism is not all that different from my own point about the circularity of many NT scholarly arguments from the Gospels. I am not arguing for the postmodernist approach however . . . Sometimes an ambiguity about the historical significance of a document can be resolved only by studying the context in which the document was produced. We saw a case of this above in the debate over the date of Hastings’s execution. But, as in that instance, it is almost never the case that the document itself is the only evidence of that context. If it were, historians might have a problem. Usually other documents yield much information about the context so that the uncertainty about the historical significance of a document is not difficult to resolve. Yes, the Gospels are indeed the “only evidence” of the context assumed by NT scholars so they really do “have a problem”. Of course the same NT scholars are aware of this problem and that is why someone like Bart Ehrman will insist that they really have multiple independent sources. But these “independent sources” are not the sorts of tangible documents McCullough is explaining are necessary: they are entirely hypothetical. Or perhaps the interpretation of the meaning of a document depends upon an historian’s judgement of the author’s purpose in producing it. Then once again, how can the document provide evidence of that purpose? Historians must interpret the meaning and purpose of documents together, accepting the most coherent account of them. The same is true when historians search for the author’s intention in writing a document. Often there is a lot of independent information about the author and the circumstances in which the document was written that enables historians to get a fair idea of the author’s intention. Independent information about the authors (indeed, any information at all about them!) is just what the Gospels lack. Often one interpretation of the author’s intention is vastly superior to all others, as none other fits the context, both textual and historical, nearly as well. But, when historians have so little evidence that the only thing going for a hypothesis is its coherence, responsible historians are very wary about attributing much credence to that hypothesis. Postmodernist approaches to Christian origins studies have left a number of New Testament scholars open to the same criticisms applicable to their postmodernist counterparts in other historical fields. My impression is that New Testament scholars have to some extent embraced the postmodernist arguments of their historian peers in an attempt to “paper over” the logical flaws in their traditional arguments. These flaws have long been the circularity at the heart of all arguments relying upon the Gospels and Acts as the sole sources of information about the Christian origins. Next post I hope to take up a number of Henige’s points from Historical Evidence and Argument. Posted on 2015-06-16 09:39:48 GMT+0000 by Neil Godfrey. This entry was posted in Historical Methods, Historical Sources and tagged Christian Origins, Henige: Historical Evidence and Argument, Historical Method. Bookmark the permalink. As any Bayesian knows, the strength of an explanation isn’t in what it confirms or coheres with, but what it says shouldn’t be. For instance, if I were rolling dice and I roll a five, this coheres with both a normal six sided die and a 1 million sided die. Indeed, a 1 million sided die doesn’t contradict rolling a five! But the six sided die is more probable because it rules out almost 1 million other possibilities (this, combined with the prior probability of me having a 1 million sided die in the first place…). The most obvious example of this failure of explanatory power is in religious apologetics. But barring the extreme cases like 1 million sided die or the existence of god (which would be represented by a die with much more than 1 million possibilities since with god all things are possible…) it becomes a much easier mistake to overlook or gloss over when comparing more plausible hypotheses. Yes. All we have to do is ask e.g. Ehrman what is the probability of us knowing about, say M, without the existence of our Matthew text. Our knowledge of the so-called M depends on the existence of Matthew and as such it is not independent. Truly independent sources mean that we would know about them without some other source. Deriving M, L, Q, etc. from our received gospels is one of the instances I see in academia of “clever argument” per se being lauded in the stead of an actual discovery. I think this is one of the reasons why historical analysis that confirms the basic supernatural (conservative) Christian view is so welcome in NT scholarship. But maybe it’s just confusion due to our language and irresponsibly moving back and forth between epistemology and ontology. Ontologically, if M exist, then Matthew depends on it. But epistemically, M depends on Matthew. The only magisterium we work in as academics is the epistemic, and we use that as a means to approximate the ontological. Logical, yes. Bayesian, not necessarily. McCullough’s statement on coherence is particularly apt. Our friends, the Memory Mavens, have to rely heavily on coherence, since in the main they reject the criteria approach. So we end up with a thesis that they insist is the most plausible because it makes sense of all the available evidence. In a nutshell, McCullough is telling us that “See? It all fits!” is a pretty lame argument. The point about coherence also strikes at the heart of a number of popular mythicist arguments: think Murdock’s astrotheology and Harpur’s revival of Christianity as another form of ancient Egyptian myths. I am attempting to get my hands on a copy. Thanks. This was a great article. I’m using McCullagh’s analytic-descriptive approach, and his inference to the best explanation model in my dissertation on Jesus’ Literacy. I think that the biblical historical-critical method (particularly the elusive and contrived Criteria of Authenticity) is long overdue to be retired from use. Finding the pre-literary authentic traditions is less likely than finding the flying spaghetti monster. Thanks. I must re-read this post to remind myself of what I wrote and read back then!